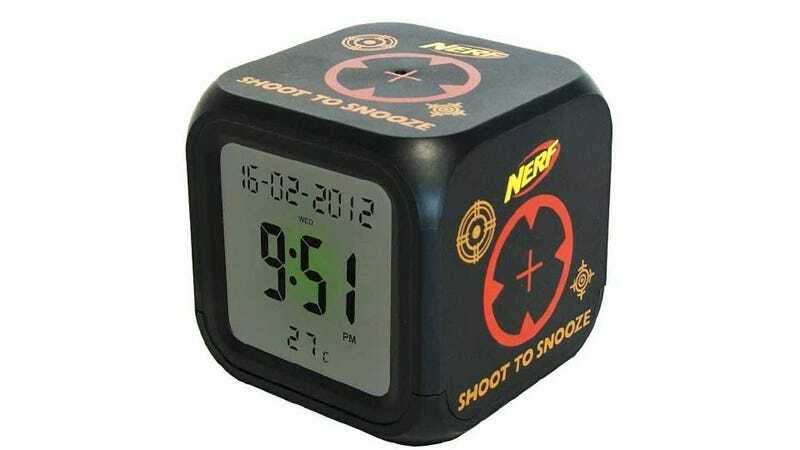 The whole 'shoot to silence' alarm clock idea has been done to death by now. But Hasbro has managed to eek out one more worthy of mention with its new Nerf-branded Shoot To Snooze alarm clock which requires groggy users to nail it with a foam dart or disk in order to silence its morning wails. Besides providing a target to take out your frustrations at having to drag yourself out of bed in the morning, the Shoot To Snooze is a fairly rudimentary alarm clock. It's got a crude segmented LCD display with a backlight that can be activated by tapping anywhere on the clock, a mandatory snooze function, and just a single melody alarm. It does have a thermometer, though, but it's only going to tell you how warm or cold it is in your temperature-controlled bedroom, so it's kind of useless. The alarm will set you back about $24 when it's finally available in September, but that doesn't include any Nerf firearms so you'll need to factor that into the cost if you're not already packing a small arsenal.